Installation views of Lorcan McGeough’s work. Photographs courtesy of the writer. If a tree falls in a forest and no one is around to hear it, does it make a sound? Both sides of this philosophical thought experiment have been debated for centuries, and its core principles of perception and participation are ones that can be applied to the process of viewing artwork. Without anybody to experience or interpret a work does it remain in a museological state, awaiting an audience? Or does it return to its base materials, existing in perpetual stasis awaiting completion? 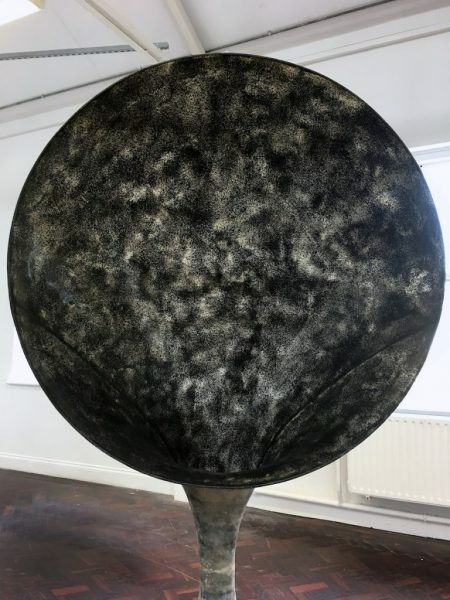 In his work, sculptor Lorcan McGeough explores this sensual connection we have to artwork, honing in on the sonic aspects of our interaction and engagement with art. 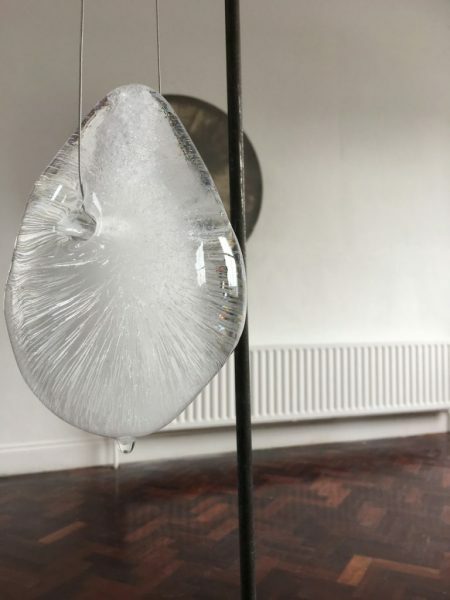 Presented are a pair of sculptures, created from coal, cement, fibreglass and steel, that see ‘ice eggs’ suspended above two well-like vessels. A familiar low pitched droplet sound is emitted from the apparatuses and alters tonally depending on your proximity. 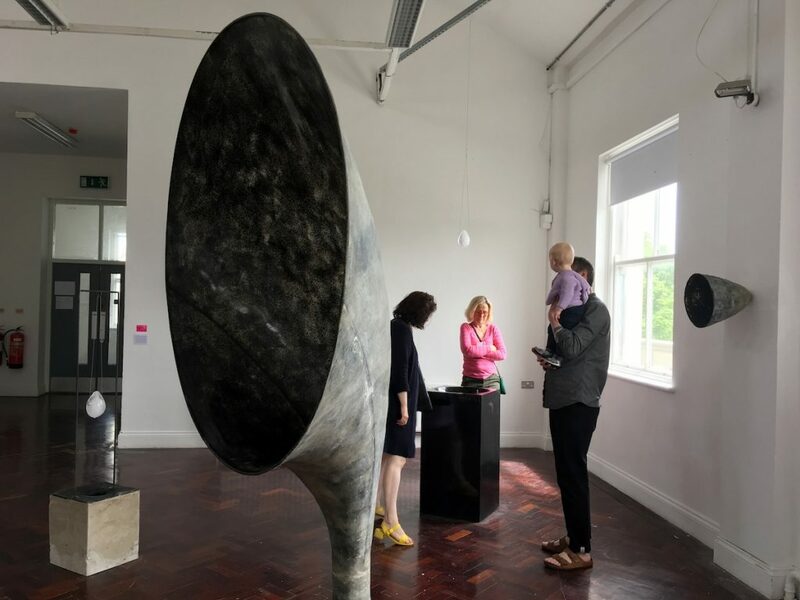 McGeough also exhibited a trio of listening devices, two mounted on the walls, with a third, of paper ash and fiberglass, standing tall – imposing but welcoming. His ‘ice eggs’ have a predetermined life cycle, transforming themselves from a solid to liquid state throughout the day – they are replaced each morning for a repeat but unique performance. The triumvirate of sonar devices, particularly the free-standing one, invites intrigue and curiosity. The presence of others in the room further enhances their animation, as more noises dance around their surface, this leads to further enquiry. This is an exhibition that requires an audience, with more participants further rewarding the fascination and embellishing the participants. The materials chosen shed their usual coldness and offer a warmth not usually associated with them. This leaves you to ponder if the sculptures are left alone, or stay unseen, do they revert back to an abrasive solitude? Art often acquires an invisible, mostly polite societal barrier, when publicly exhibited. We are encouraged to engage with a work but also observe its boundaries and keep a respectful distance. McGeough’s work offers a refreshing break from this convention, with the pieces encouraging viewers to hunch down and peer into the wells, or crane over to listen within the devices. This helps establish a connection between audience and work, but also positions the sculptures in a strong and stable stance – we come to them. What is clear from viewing McGeough’s work is that without an audience an artwork is not complete, but this relationship is also reciprocal and our presence in the room is dictated by that of the work. Originally published on CIRCA Art Magazine as part of their Degree Shows 2017: Writers’ Choice series.